This post is the third and final piece documenting the Bed Project, wherein I designed and built my own bed. 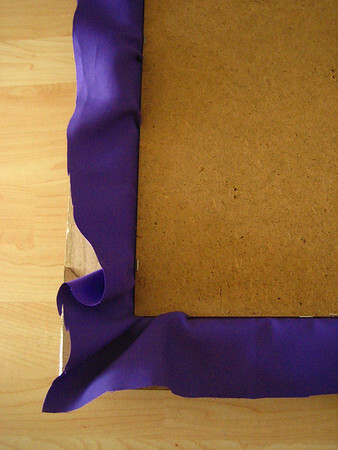 The last step to completing my bed was upholstering the entire particle board box. I purchased enough sheets of one-centimeter-thick foam from a local foam store. 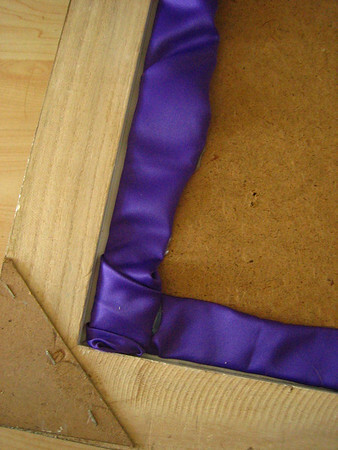 The foam store employees agreed that foam thicker than 1 cm is difficult to upholster using just a simple staple gun. 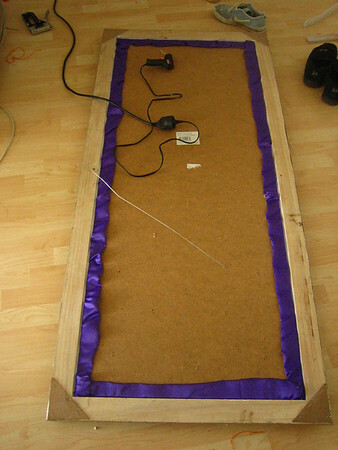 Using a regular staple gun from the hardware store, I covered the four box sides of the bed. I tried to not staple anywhere that would be visible or touchable on the top or side of the bed. 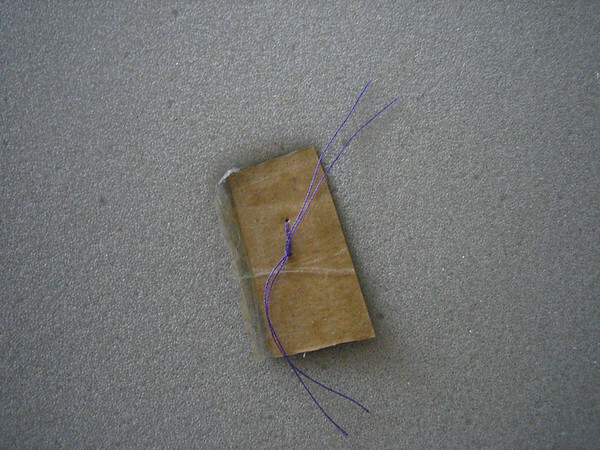 Instead, I stapled on the inside edge of the boxes where the mattress would hide the staples and under the lip of each empty-bottomed box side. 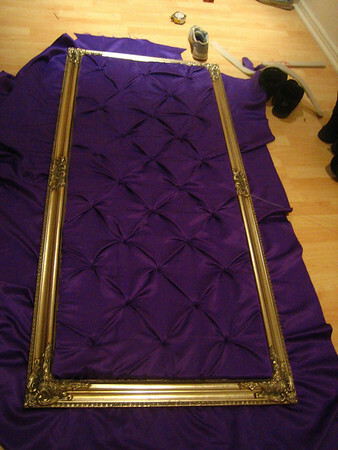 The bed in it’s partly upholstered state is shown here below. 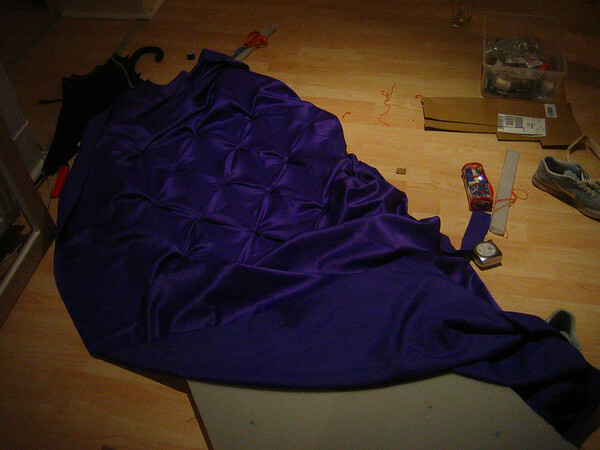 Folding the fabric over on itself and gluing it to the backing board with a hot glue gun was the final step. 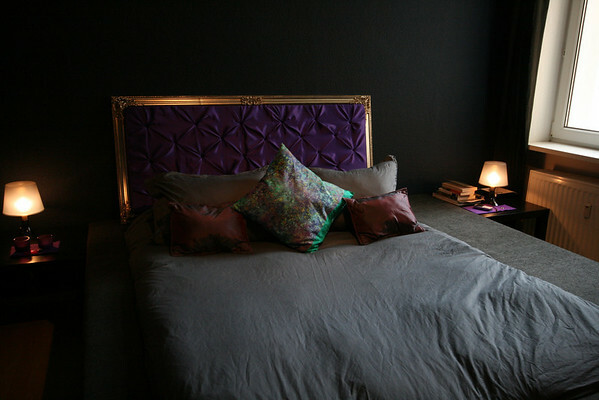 The purple satin headboard is hung on the wall behind the bed and makes for a comfortable place to lean and read a book in bed. That wraps up my Bed Project documentation on how to design and build your own bed with a minimum of tools. I hope with this series you might be inspired to design and build your own modern designer bed. This entry was posted	on Thursday, September 4th, 2008 at 13:32	and is filed under projects. You can follow any responses to this entry through the RSS 2.0 feed. You can leave a response, or trackback from your own site. I absolutely love this bed idea. I’d love to have seen the ‘extended’ bit being used as storage too. I’d probably try to do a project like this myself when I move out. Brilliant. Nice to see you hard at great work. I like the bed, but the headboard which seems to take the minimalism, simple and great lines of this bed design. For the pratical side, my bed hasn’t any headboard, and a simple pillow makes it perfectably confortable to lean! 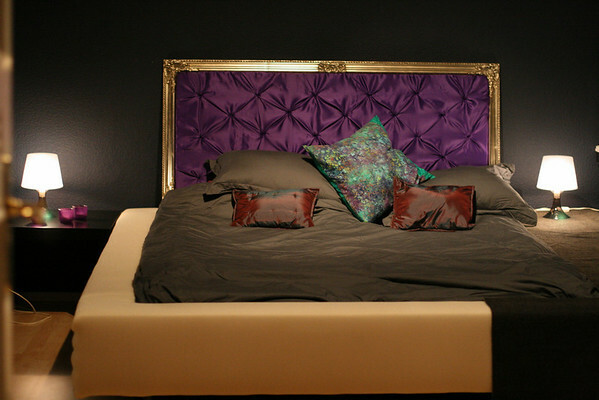 I love this bed, especially the headboard! Out of curiosity, how portable is this bed? If you move, will you have to completely disassemble it? I love this bed and am planning on making one for myself! But I am curious as to the total cost of this project. Can you please provide some rough numbers? Hi, love the headboard idea… and would like to do something similar .. can you tell me if the foam sticks out of the frame ? and if so how do you stop it from coming out the front ? In other words.. I would like it to be nice and cushony and cant figure out how to make it thick and still be able to secure it ..